Samet is the Thai name for the Cajeput oil tree which grows on this island. This oil can be used in cosmetics and for massage. This small island is only a few hours (3 to 4) away from Bangkok. During weekends its packed with people from Bangkok. The island is also close to Pattaya. There is some nightlife on the island but don’t expect noisy disco’s with top DJ’s from around the world. You can have a romantic dinner with fresh see food at one of the beach restaurants. Snorkelling and island hopping trips with a speed boat are a popular day activity on the island. The island is part of a national park. Therefore every visitor has to pay an entrance fee. 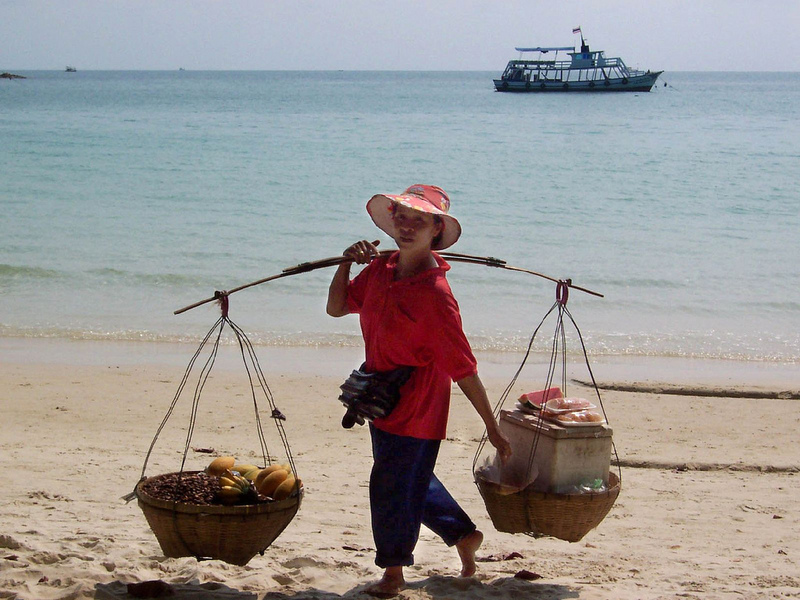 The island is located about seven kilometers from the main land, in the Gulf of Thailand. It can easily be reached by a small old fashioned ferry boat from Ban Phe pier. Most mini vans from Bangkok will drop you here. The boat trip will take only 20 minutes. A complete description can be found at the website of Learning Thai With Mod. Travel report from www.readme.me: 3 days 2 nights at Koh Samed.